Please have all the maintenance procedures laid down in the Owner's Manual, pages 16--31, carried out regularly by an authorized BMW dealer, and make sure that the work done is confirmed by rubber stamp and signature in the appropriate spaces of pages 72 and 73. These details must be available before any guarantee claims can be considered. Before you receive this vehicle from your dealer he will have carried out a free pre-delivery check. These is a schedule of the volume of the inspection work on page 75. Performance of that inspection work is verified on page 74. After the free services at 300 and 1000 miles, and commencing at speedometer reading 3000 miles, alternate Minor Service and Major Service procedures should be carried out at 3000 mile intervals. In the interests of obtaining maximum reliability and long service life from your vehicle, we recommend that at least two services per year be carried out even if the prescribed mileage as per the servicing chart on page 16 has not in fact been completed. We have calculated work time schedules for all service operations, and BMW importers or their authorized dealers will invoice you in accordance with the rates current in your country, using the official times as guides. All lubricants, gaskets etc. used, any cleaning work necessary will be shown separately on the invoice. In all export markets it is customary to make an initial charge for the free services Nos. 1 and 2. Your dealer will then credit you with the officially recommended value of this work. Any sum in excess of this value you will be required to meet yourself. Please keep this Owner's Manual in the tool box of your motorcycle in the at all times. The service supplement of this Owner's Manual is not transferable. Check oil in engine, transmission, rear wheel drive, shaft housing. Check for operation: headlight high and low beam, parking light, stop and licence plate lights, red turn signals and indicator lights for: high beam, charging control, neutral, oil pressure and horn. Bolts and nuts see page 31 of instruction manual, check for correct torque. Test drive, check operation of clutch, gear shift mechanism, speedometer, steering, foot- and hand brake, idling speed of engine. Check outer condition of vehicle. Change oil in the engine only when engine has reached normal operating temperature replace oil filter cartridge. 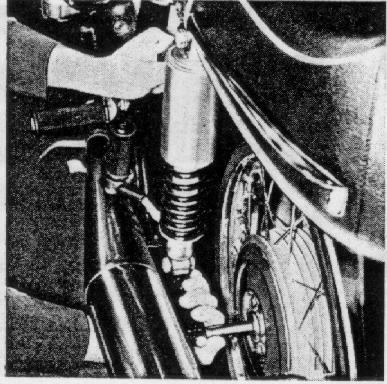 Check torque of the four nuts for the trough studs (cylinder and cylinder head and locker arm attachment) and of the two additional cylinder head bolts (25 lb/ft), tighten if necessary. Check valve clearance, adjust if necessary. Intake = 0.006 inches, exhaust = 0.008 inches. Change oil in the engine only when engine has reached normal operating temperature, clean oil pan and oil screen. Lubricate rear wheel swing arm bearings. Lubricate brake and clutch levers and throttle assembly. Change oil in drive shaft housing. Change rear wheel drive oil. Check fork and wheel bearings, adjust if needed. Clean carburetor and adjust if needed, check throttle cables and adjust. Clean petcock screen. Check electrode gap of spark plugs. Check contact breaker cap and ignition timing. Tighten cylinder head nuts (25 lb/ft), then adjust valve clearance when engine is cold. Tighten nuts and screws, (observe torque figures, see Technical Data). *) Lubricants, oilfilter and gaskets are at the expense of the owner. The Vendor hereby guarantees freedom from defects in respect of materials or workmanship in accordance with the technological standards applicable at the time for any purchased article leaving its factory, such guarantee to remain in force until a total distance of 10,000 km (6,000 miles) has been covered, but in no case longer than 6 months commencing with the date on which the purchased article is first licensed. No claim under the Guarantee will be entertained unless it be notified immediately following discovery to the Vendor, a BMW contractual agent or a BMW contractual workshop. The Vendor hereby guarantees to repair the purchased article or to replace defective parts, the decision of the Vendor in this respect being final. The Vendor may determine the place where the guarantee work is to be executed, giving due consideration to the interests of the Purchaser. Protection under the guarantee shall be afforded by the Vendor even in respect of parts not manufactured by the Supplier's works, with the exception of batteries and tyres and tubes. In respect of these last the Vendor hereby assigns any entitlements under guarrantee made to the Vendor by the suppliers to the Purchaser. The Vendor shall not be held liable to entertain guarantee claims in respect of incandescent bulbs and spark plugs. If a guarantee claim be accepted by the Vendor, the latter will also be responsible for the cost of despatch by the most economical method and all reasonable installation costs provided always that the installation be carried out by the Vendor, a BMW contractual agent or a BMW contractual workshop in accordance with the instructions issued by the Supplier's works. Parts exhibiting defects in materials or workmanship will be replaced, together with all parts damaged as a result of such defects. Parts replaced in this manner become the property of the Vendor and must be surrendered. The vendor shall not be liable under the terms of the Guarantee for neutral wear and tear or damage attributable to neglect or improper treatment, nor for damage occuring through incorrect storage or corrosion. the Purchaser uses the purchased article in competitive events. No claim for the reimbursement of direct or indirect damages will be considered. No claim regarding amendment to the purchase contract or reduction in purchase price will be considered. No guarantee is extended in respect of secondhand motor vehicles.